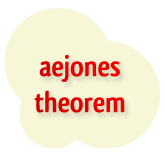 As with the majority of theorems, the aejones theorem was name after a poster at the 2+2 forums named “aejones” - surprise surprise. This theorem is actually pretty tongue-in-cheek, but I'm going to discuss it anyway. If you take it literally, no. The chances are that you didn't need me to tell you that, but it's good to make sure that everyone knows where they stand. If you use the aejones theorem during play, you will lose money. But still, that's not to say that we can't salvage something useful from this theorem. The idea behind the aejones theorem. Players do not always have as strong a hand as you think they do. Betting, raising and general aggression is often enough to make your opponent fold. Whilst there is an element of truth in both of these points, if you go all out betting and raising as the theorem advocates, you are not going to be winning much money. Of course there will be times when you win pots due to your aggression forcing other players to fold, but this style of play is just going to land you in very unfortunate spots time and time again. Taken literally, the aejones theorem suggests that wild raises and calls are the order of the day at the Texas Hold'em poker tables, and we both know that isn't the case for any successful poker player. What can you learn from the aejones theorem? Your opponent is not always going to have the absolute nuts. First of all, understanding that your opponents will not always have the absolute nuts when they are betting into you will serve you well when it comes to analyzing plays and making decisions. Because we never know the exact two cards our opponent holds, it's easy to fear the worst when facing a bet, when the fact of the matter is that our opponent may be just as scared of what we are holding. The core of the aejones theorem is that players can often give too much credit for what their opponent is holding. I am not suggesting that you should think that you can always force your opponents to fold with a reraise, but simply to remember that both players in a hand have concerns about what their opponent holds. If you can sensibly take advantage of this mutual caution during play, you might be able to pick up a few extra pots. Secondly, as you should know, aggressive poker is winning poker. You don't win pots big pots and make opponents fold by playing passively, so always try and play poker with controlled aggression. Have a browse over the article on the importance of aggression in poker for more information on this topic. Aaron "aejones" Jones is a very high stakes professional poker player. Aaron currently records training videos for LeggoPoker, which is a popular online poker training site. You can also read aejones' Leggo Poker blog, which is updated fairly regularly. If you're feeling a little stalker-ish and want to check up on aejones' past, you can read all of his previous posts and threads at the 2+2 forums through aejones' 2+2 member account. Despite the fact that the aejones is very tongue-in-cheek, it does actually bring up a few subtle but useful points if you look hard enough. This article may or may not have changed your outlook on the game, but either way the aejones theorem is one that I thought was worth discussing to try and extract some good from it, in addition to clearing up any confusion with what the theorem implies. At the end of the day though, just be sure to not take this theorem literally, and certainly do not use it the next time you sit down at the tables.